It seems the drought we've had this summer is causing an early fall. My thoughts are already turning to the things we need to do around here to get ready for the cooler weather. We may be stocked well for some things, but there are still a few items that would make the coming winter a little cozier. I've been shopping for dutch ovens (for the Mister's annual winter camping trip, which I've mentioned here before) flannel sheets (a winter necessity at my house) and I always have an eye out for food storage items (for when the mice arrive). But for right now, it's all about cleaning out the garden. This year it was one of my goals to harvest my fresh herbs and figure out what to do with them before frost. 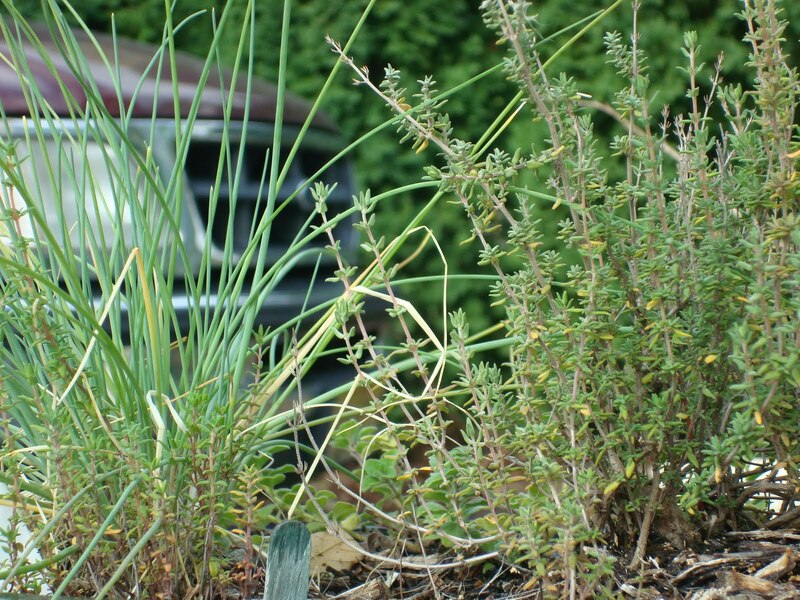 Now as some of my readers with longer memories may recall, last spring I acquired some new varieties to try out (rosemary, oregano, and lemon verbana) and they have all done fairly well in pots on my front step, and are now safely past the seedling stage. 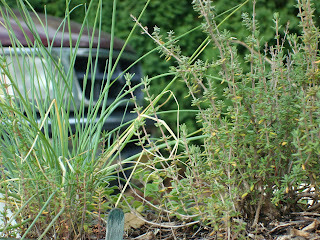 Those herbs were in addition to my round of regulars- chives, basil, parsley, cilantro, dill, thyme, and lavender. I selected most of these for use in cooking, except for the lavender which just smells good. It's my intention to incorporate a few new ones each year so that eventually I'll have a more well rounded selection. But these are the ones that get used most in my recipes. One thing I am terrible at is trimming the herbs and harvesting them regularly, which actually helps their growth. Cutting them and hanging herbs upside down to dry must be the hands-down most popular way to save herbs. Unless you are fortunate enough to have a dehydrator, and then you can use that to dry them. Another less popular method is to densely pack your herbs into ice cube trays, fill with water, and make herbed ice cubes which you can add to soups or defrost later to use the leaves. I tried that in the past (I even tried a complicated method to freeze basil leaves, involving layers of wax paper) but found that after months in the freezer, the herbs no longer retained any iota of taste. What a disappointment! But I did have had success with freezing one herb- rosemary. Whole, on the stem, and just placed in a freezer bag, rosemary stays green and tasty for an extended period of time. This is great since I love to chop its leaves and bake it into bread. This year I'm drying oregano and thyme, which I'll then place in an airtight container and chop or grind as needed, and the chives will be frozen whole to use the same way. Lemon is one of my favorite flavors, and my lemon verbana has been so useful. As it grew tall and spindly on its woody stems, sprouting fragrant leaves, I started to ponder ways I could enjoy it even more besides smelling it when I walked by. Of course I've done the obvious, drying some for tea and chopping the leaves into fine bits and sprinkling it on fruit salad. Then I discovered how to infuse it in a sugary syrup, which added to (what else?) lemonade makes for the sweetest and most delicious glass of lemon drink you could ever enjoy. This is one herb that I would consider freezing in ice cubes, because it would be nice to add those cubes to lemonade. Making pesto is my favorite way to harvest basil, and the one way I've found to retain the most taste with storing basil. Pesto is easy to make in the food processor, and it freezes well. Then, you can simply defrost it and use it in place of sauce on pizza, on baked potatoes, toasted bread, or with pasta. You can make it with or without pine nuts (which are expensive) or use walnuts instead. By far, my most mysterious herb is dill. One year I planted a half row of Mammoth Dill so I could do a large batch of pickles. This dill was 3-4 feet hight, and we couldn't use all of it, but enjoyed what we could. After the heat got to it and it went to seed, I noticed new dill plants springing up all over our backyard. Even though we haven't planted dill since, I could probably find some growing somewhere on our property right now. It's the herb that keeps on giving. My favorite way to eat it is to put a few sprigs in green salads. Of course being a gardener, I forever live in "next-year land" and am already exploring some new varieties for next year. And of course, I'd love to hear what herbs do well for you ad what you use them for, so please share! 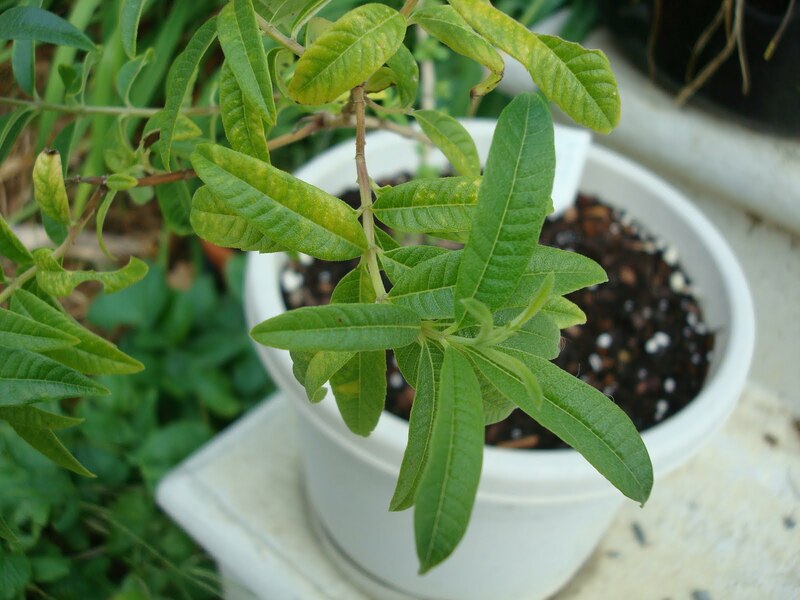 Ooooh, I just bought a lovely Lemon Verbena plant--do you keep yours indoors during the winter? I too love the smell of Lemon--I had a large patch of Lemon Balm that went crazy, but I never did as much with it as I should! Aim- This is the first year I have had one, and was told when I bought it to bring it in during the winter. It will go dormant and then do its thing next Spring. You know, I really need to try lemon balm next year! I have a good crop of oregano, basil, fennel, caraway and camomile. 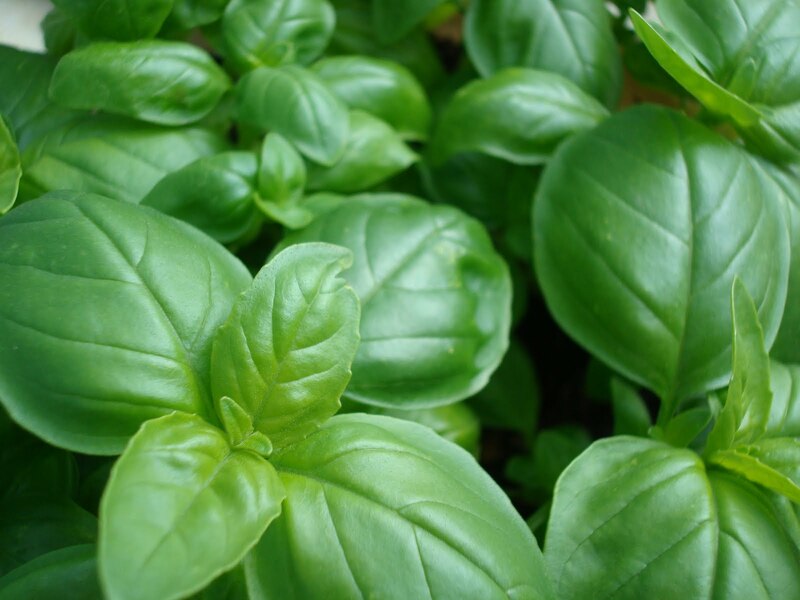 I'm getting ready to use the basil in a pesto to freeze since I love it on chicken, noodles, tomato sandwiches and many other things, but what about caraway. Can the green part be used? I've only used the seeds in and herbed bread. I tried using a little of the camomile leaves in a tea. It was good, but should I dry some? Will they taste the same? I like fennel, but mine didn't globe up very much. I'm wondering if I need to start it earlier. Perhaps our growing season is just not long enough. One day I stuffed some fresh fennel leaves, basil and oregano into the chicken. The flavor was outstanding. I'm looking for other ways to used all of these herbs. I also want to add to my collection next year. Lemon verbina sounds interesting. Do you have the recipe for the lemony drink you make from it? Thank you for sharing this very interesting post. My problem is this..Spring shows up and we get planting fever. I go to greenhouse and they have such good deals on these beautiful green plants so I buy some. They grow well, Fall comes and it is time to harvest and dry them. Then what?? Guess I need to figure out how to integrate more herbs into my cooking. That's the most perfect looking basil I've ever seen! Did you grow this one yourself? @BAT Mom- yes, I grew it from seed. Started in a windowsill, and transplanted outside. It's the last basil of the season with the cool weather coming, and will likely end up as pesto. Another way to preserve is to put the herb into the food processor, spin, and add olive oil. Pour into ziploc bags. Lay flat on cookie sheet. freeze. You can chip off what you need through the Winter. Thanks Stace! I'm wondering if the olive oil helps to retain the taste of the herb since I've done a similar method in the past using water instead and found the herbs to be wilted and bland. I love oregano too. It is a great anti-oxidant that can detoxify your body. It's a great herbal remedies for cough and colds.